Oil beetles are large, charismatic and somewhat strange looking insects that have been described as looking like a fat man who’s waistcoat doesn’t quite fit. The ‘waistcoat’ is the short wing cases that do not fully cover the beetle’s abdomen. Oil beetles can be locally common on sites, however they are under threat. Four of the UK’s native oil beetles are now extinct, and data collected by Buglife – The Invertebrate Conservation Trust showed that the remaining four species are in decline due to changes in the way our countryside is managed. In response to these declines, Buglife have produced a new Species Management Sheet aimed at helping landowners and managers conserve oil beetles on their sites. Oil beetles have an extraordinary life cycle which is intricately entwined with solitary mining bees. Juvenile oil beetles are tiny, louse-like creatures that emerge in spring and lie in wait on flower heads for visiting bees. The triungulins take advantage of the bees, firstly by hitching a lift on their back, and again in the bees’ nest, by eating the food collected by the bee for its own young; the beetle equivalent of a cuckoo. The larval oil beetle then develops within the bee burrow and emerges as an adult the following year. Because of this complex lifecycle, oil beetles require large populations of mining bees. A decline in the population of mining bees, for example through the loss of wildflower habitat, can quickly lead to the loss of oil beetles. In this respect, oil beetles act as an early warning system that habitat quality may be declining. The most important factor in maintaining oil beetle populations, and the solitary mining bees upon which they depend, is the long-term maintenance of wildflower-rich, semi-natural habitats. Oil beetles are normally found on wildflower-rich sites with a succession of nectar sources through the spring and early summer such as unimproved grasslands and glades or rides in woodlands. South-facing slopes with well drained soils are particularly favoured. Most oil beetle sites are maintained through grazing with cattle or sheep or by wild animals such as deer or rabbits however some sites are kept open through trampling by walkers or the natural process of cliff erosion. Normally, grazing is the preferred management option, but it needs to be controlled, as high stocking densities can be detrimental to oil beetle populations through overgrazing of wildflowers and physical damage to bee burrows. Early grazing should be avoided, but summer and early autumn grazing is important to keep the sward open through till the following spring. Unless there is a history of mechanical cutting on a site, the introduction of a cutting regime should be carried out cautiously and cutting should occur in mid to late summer. Early cuts should be avoided as this is when both oil beetles and their host bees are most active. Autumn cuts should also be avoided if Rugged oil beetles (Meloe rugosus) are present, as the adults of this species emerge in autumn. 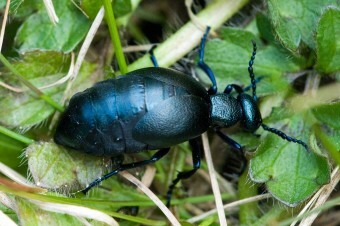 The full management guidance and an oil beetle identification guide can be accessed on the website at www.buglife.org.uk. Photo credit: Oil beetle (Ben Lee). Article written by: Buglife – The Invertebrate Conservation Trust is the only charity in Europe devoted to the conservation of all invertebrates, and is actively working to save Britain’s rarest bugs, bees, butterflies, ants, worms, beetles, snails and many more fascinating invertebrates.